1Keep track of what you eat. 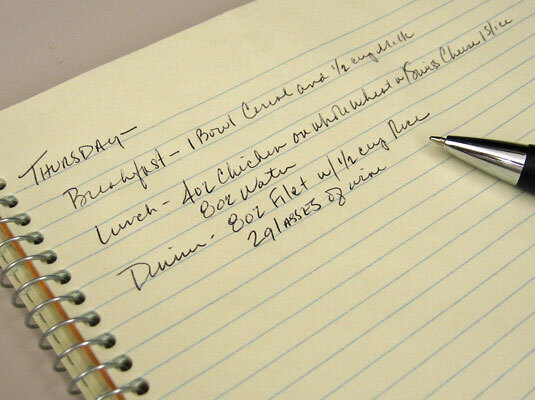 Buy a small notebook and write down everything you eat for two days during the week and one weekend day — including that handful of M&M’s, the dressing you put on your salad, and the pat of butter you put on your potato. Don’t forget to include beverages, too. People tend to eat differently on weekends than on weekdays, so including a Saturday or Sunday in your tracking is important. Make sure, too, to accurately estimate the amount of each food that you eat. Studies show that most people grossly underestimate their portion sizes — and can’t figure out why they don’t lose weight on their diets. 2Weigh or measure your servings. The best way to determine how much you’re eating is to weigh and measure your food. Fill your plate with the typical amount of food that you eat and then use a measuring cup, spoon, or scale to determine your serving size. Most people find it easiest to write down what they ate immediately following each meal; otherwise, they tend to forget about the incidentals, such as the glass of wine or soda, or the butter on the bread, and the amounts. 3Record calorie counts for everything you ate during the day. Then simply tally the number of calories for each food based on the amount you ate, and total up for the day. 5Average the calories to get an accurate daily count. After your three-day recording period, add the total calorie counts together and divide by 3. This gives you the approximate number of calories (give or take a few) that you eat on average each day.